Here's an easy recipe for cookies that are a slight departure from the more traditional oatmeal raisin cookies that everybody loves. 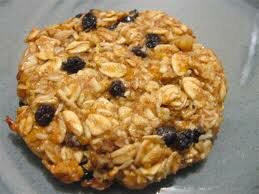 This is my version of oatmeal cookies with chocolate covered raisins! Mix all ingredients together, chill for 30 minutes. Drop by the tablespoon full onto a silpat liner or parchment paper. Bake for 12 minutes. Cookies will be very soft. Let cool on the baking sheet for 10 minutes, remove to a cooling rack until completely cool. it doesn't tell you what temp to put oven at?? ?